Overall Approx size:187L x 51W x 81H. 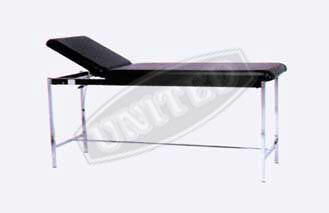 Adjustable backrest by gas spring system. Two section Foam padded, upholstered top. 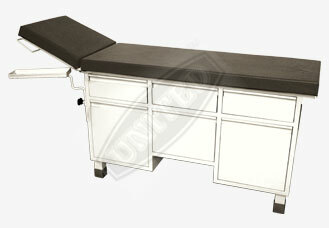 Provided with three Drawers and three Cabinets. Tray for B.P. Apparatus provided near head rest. Finish : Pre treated & Epoxy Powder Coated. Frame work Rectangular & Square Steel tubes. Adjustable Back Rest by hand lever. Legs fitted on PVC stands. Overall size 183L x 60W x 81H cms. Frame work of CRC tubes. Legs fitted with PVC stumps. 5 cms foam cushioned top covered with rexine. 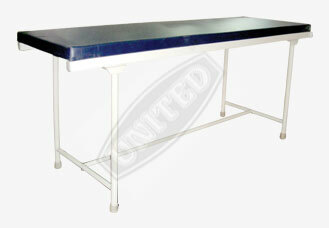 We offers best hospital furniture.